Does your church know how to reach out to people who live with chronic illness? How should you react when God doesn’t choose to heal? When are casseroles and get-well cards not appropriate? If you’ve ever wondered about the do’s and don’t’s of witnessing to someone with a chronic illness, you won’t want to miss this! Lisa will lead you through how your church can more effectively outreach to people who live daily with illness and pain through her own experiences and stories of others. You will be given an opportunity to see “church” through the eyes of someone in pain, and recognize the small changes that your church can make to have a more effective illness/pain ministry to hurting individuals. Appropriate for churches, church leadership or conferences. 50 minutes, but can be adapted. Have you ever had a friend who was hurting and you didn’t know what to say? How do you know when to quote the Scriptures and when to just listen? If someone you care about lives with chronic illness, grief, or emotional pain, you won’t want to miss the opportunity to learn how to be a good friend. If you live with illness or disability, you will smile in understanding as Lisa shares her experiences and the stories of others who live with chronic illness. The time spent will give you a sense of relief and comfort, as you learn how to express your sincerity to hurting friends. Appropriate for Christian and secular audiences. 45 minutes, but can be adapted. Chronic Illness & Our Hope and Dreams: Keep ‘Em or Wean ‘Em? When we live with illness, we often feel frustrated with our ability to make plans and goals. Dreams fall aside as we just try to get through life. How do we continue to pursue dreams? Which ones does God want us to keep? Which ones should we give up? This upbeat, realistic look at dreams will hit home for anyone who has experienced life that comes after chronic illness. And even when Lisa discusses the difficulties of these choices, her sense of humor will keep you smiling. Appropriate for Christian audiences. 45 minutes. “I’m sorry,” he offers with a sympathetic voice, but there is little else he can do. “Actually, I sort of feel nauseous too,” I share. “It’s probably just the drugs. I wonder if I should eat something or if that would make it worse. I’m sure it will pass if I can just get to sleep.” I look over and he is already starting to snore. For many of us, our spouse is our best friend. If our relationship is good, we want to share our feelings with them. Even if our relationship is hurting, we feel that by explaining our pain, our spouse may sympathize and be more loving toward us. Galatians 6:2 tells us “Carry each others burdens, and in this way you will fulfill the law of Christ.” At some point we must carry these burdens to the Lord, as well as a close friend, rather than just count on our spouse to carry the burden of listening about each ache. Although your spouse may not be suffering from a physical ailment, there are still many losses that he is grieving. For example, it is an emotional thing to watch someone you love be in pain and not be able to fix it. He may be suffering as he watches you lose the ability to do things you love. He likely misses the couple outings you once took together when you could do physically active events, whether it was skiing, or just taking long walks together on the beach. He may be frustrated that even his hugs can cause you to wince. Counselors have found that there are three major areas where marriages suffer: money, time and physical intimacy. Your marriage may be having difficulties in all three, specifically because of the role chronic illness has taken on within your marriage. Is it possible to “share our burdens” with our spouse without overburdening him and making him want to run the other way every time we open our mouth to share another symptom of our ailments? It’s you and your spouse “up against” the illness. Although you may feel like your spouse is merely a spectator, intentionally make him a part of your team fighting the battle of pain, in whatever way he is most comfortable. Ask your spouse if you can share some information about your illness so he has a better idea of what you are going through, but don’t overwhelm him. If he is willing to attend a few doctors appointments with you, let him, and give him time to ask the doctor his own questions. For example, giving him a brochure may be better than handing him a 250-page book. If he listens to podcasts, find some that would be beneficial for him to listen to. Acknowledge that there may be role or responsibility shifts in the marriage due to the illness. Be open about what you are struggling with and where you need help. For example, if you can no longer scrub that bathroom but, let him know before the grime gets out of hand. We often marry someone who has our opposite personality style. If you need to read every article about your illness, but your spouse doesn’t, it may simply be because your spouse has a more laissez faire attitude, not because he doesn’t care. His response to a crisis may appear to be nonchalant on the outside, but it doesn’t mean he is not worried and concerned about you. On the flip side, maybe you are emotionally overwhelmed the diagnosis and you need to just sit back and take it all in before you start doing research, while your spouse is spending hours at the computer finding out everything he can on the latest treatments, medications, and signing you up for the healing service at church. He may accuse you of being in denial about it all, since you aren’t showing as much passion as he is in finding out more about your illness. An excellent book recommend in helping you understand your communication styles better is “Men are Like Waffles, Women are Like Spaghetti” by Bill and Pam Farrell. If your illness is going to cause you to be in the bathroom during eighty percent of the events you attend together, you need to let your spouse know that this is part of the disease. Health organizations have brochures on symptoms. You can say, “I’m dealing with some personal matters of this illness right now; I don’t really want to talk about them yet, but they’re in this brochure if you’re wondering.” Avoid sharing every detail if you can. What else do you have going on in your life, other than your illness? It’s easy to be overwhelmed with doctor’s appointments and just maintaining our illness, but it can result in a pretty dull life. Even if you have limited energy, do something you’ve always wanted to do that doesn’t have a deadline. Put together memory albums for your grandchildren, clean out just one drawer, find a new craft or hobby, volunteer to be on a prayer chain. Soon you will find that your illness actually is the last thing you want to talk about when you have had such more interesting events in your day. So. . . How much is too much? It’s different for each person and each marriage relationship. Learn to look at your situation objectively. How many times are you bringing up your illness? How are you benefiting from talking about it more than necessary? Do you need understanding? Validation? Perhaps you need actual physical help with tasks. Ask yourself if talking about your illness could be a way of getting your spouse’s attention, and this seems to be the only thing he responds to? Regardless of whether it is attention, acknowledgment or understanding, how can you get this from God instead? How is it negatively affecting your life or those around you? For more articles and important support while living with chronic illness or pain visit Rest Ministries so you don’t miss our fresh content and be entered for our monthly giveaway. 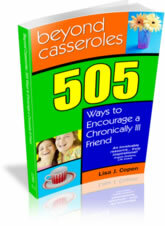 Lisa Copen is the director of Rest Ministries, author of “Beyond Casseroles: 505 Ways to Encourage a Chronically Ill Friend” and founder of National Invisible chronic illness Awareness Week. Look More Awake for 12 Bucks? Sure! So, I turned 41 last week… during Friday of Invisible Illness Week! I remember being one of the youngest gals everywhere I went… now I am looking at “age defying” make up. Here is one item I am adding to my arsenal though, and regardless of your age (or gender) if you are in chronic pain and up many nights, you may be interested too. It’s the new Garnie Nutrioniste Skin Renewal Anti-Puff Eye Roller. You just roll this “massage roller” that has a caffeine gel in it, under your eyes. It helps stimulate “microcirculation around the delicate eye area.” All for about 12 dollars. I purchased this in August. The coolness of the metal tip of the applicator feels good, regardless of how well the product worked. But I wonder… could it be making a difference? The puffiness and creases seem a bit smaller. So whether it’s helping or having a placebo effect, I’m satisfied. I am up and at the computer about to start day 2 of National Invisible Chronic Illness Awareness WeeK. Your prayers have been so appreciated and I am thrilled that day 1 worked out so well with no technical glitches, no computer errors, etc. This year I really wanted Georgia Shaffer to speak and Monday morning was the only slot she had available since she had a full week. (Thanks, Georgia for squeezing us in!) So we kicked things off and jumped right into talking about how we deal with our difficulties in life in different ways. We had over 200 listeners for our first show so we were off to a great start. I have a pumpkin candle to create some atmosphere in my office, but am too scared to light it, so instead am just spritzing pumpkin room spray around. It smells like fall. I keep trying to turn and prop my feet up on a chair. My feet are swelling again and I don’t know if it’s the weather, or due to sitting so long here, or the angle of the chair. I keep moving everything to try to rotate positions. After the second show the phone rang and it was my parents. My mom said, “If it’s okay, I have a plane ticket I can get.” Okay? Yes! My parents had just returned from a trip to TN the day before (after being stuck overnight at SF due to plane issues). I hadn’t asked her to come for II Week because I didn’t think she should be returning from a long trip and then fly down here. She has her own chronic illness issues. But she said, “If you can do this, I can get on a plane. This is why I retired. ” Thanks to Dad who encouraged her to go and gave her 20,000 of her airline miles so the ticket was affordable. My son gets out of school each day at 2:20 and I have shows at 3 and 5:30. Let’s just say I was desperate enough for childcare, after asking everyone I knew, to post it on Facebook. I figured maybe someone from Rest Ministries would know someone in San Diego and they could watch Josh in my home while I was just in the other room. But my mom is a’comin and should be here by noon today. I explained to Josh’s teacher that this week was chaotic, and not normal, and that my mom would be picking him up the rest of the week. If I sounded a bit frazzled when I first came on the line with Joanna Faillace for the 3 o’clock show it was because I picked my son up from school at 2:20. We ran home, I handed him milk and a snack, threw his karate uniform on. Packed him a snack to take. He said he’d wait in the driveway for his ride. I told him he could wait in the house, but he was feeling like a big boy and when I called “I love you!” he hollered back “I love you too.” Ahhh…. Just as we went live he appeared in my office and said, “They aren’t here yet. I’m thirsty.” I hit the mute button and said, “Go back outside. She’s coming. Milk is int he cooler.” I started the show and mouthed to him “I can’t talk” and waved. He went back outside and stood out there to wait for one of my dear friends to pick him up and take him to karate. I left her a bag of mail to drop into a mailbox even. Thank you, Shelley! Once Joanne started talking I muted myself, took off the headset and ran out there to see if he was still there (Sorry, Joanne!). I had told him to come tell me when Shelley got there. He was gone. So was the mail. Okay…a kidnapper wouldn’t take the mail, right? I ran back in and was back on the show. Joanne had a wonderful presentation about eating right, foods that are super-naturally healthy, and as always when I talk to her, I came away with some simple things I could easily do to improve my health- and dare I say – even metabolism. Now there is some motivation! I was glad I was keeping my food diary yesterday because I was stressed out enough I would have been eating more than I should. I got off the phone and called Shelley to make sure she had Josh. They were finishing up karate learning cart wheels and then she was taking him to another a friend’s house to play. I called and left messages for my husband to pick up Josh (“I don’t have the address. He’s playing outside. It’s 2 or 3 houses down from Shelley’s house. Call me if you can’t find him.”) I reminded him to pick up drugs for me at the pharmacy too after work. And then left 1 more message to pick up eggs. We finished at 6:30. I called my mom to make sure she had her ticket. I called Joel to make sure he found Joshua. They were looking for a clean restroom somewhere near the pharmacy (2 stores didn’t work) and they got home after 8. I worked on blogs and answered emails until then they arrived home. Gave my kid a big hug and told him how proud of him I was. I grabbed a Nutrisystem lasagna and we ate at 8:15. I had Joel show me how to get the video game out of of the Playstation and then I went to Blockbuster at 8:45 to drop off movies and games that–if were not returned by midnight 9/14–we’d be charged for. My husband volunteered, but actually I just wanted 15 minutes in the dark car alone and I blasted the “Our Hope Endures” song by Natalie Grant. I just picked up the CD last week as my “gift to myself” for this week and love her song “Our Hope Endures” that came out around the time I started Hope Endures podcasts last year. I will post a link to it later. Amazing song, and lyrics about a friend of hers that has cancer. Got to bed by 10. Got back up at 10:30 and worked till 11:30. And -praise the Lord, slept! Got up at 7:15. I haven’t showered yet but I did throw on some clothes. I had a quick breakfast, watched 10 minutes about remembering Patrick Swayze on the Today show (sad), spent a few minutes in prayer and am going to be answering emails until the show starts with Pam Farrel (so excited to have her!). Then I hope to prepare a bit for the shows today, especially the one I am supposed to be doing on starting a business, since our second scheduled speaker had to cancel due to a family emergency. I have orders to send to our warehouse, and then need to grab a bite to eat. Please keep us in prayer today. The shows, guests, listeners. Our guests that had to cancel have unspoken prayer requests. My mom’s best friend is 80 years old and having open heart surgery today too. She went into surgery at 7 a.m. and it should last 4-6 hours. So many people are hurting, including many of our speakers who are all coping with their own illnesses, and still doing the shows for all of us. I hope that together we can reach out to everyone who needs reminded with the Lord’s love and hope. God bless you, friends. Thanks so much for your support. Who is Talking About What for Invisible Illness Week Conference?